There are many ways to cook the heart. Pickling is an easy way to go, and it will let you enjoy it for more than just one meal. Let’s talk about the heart. 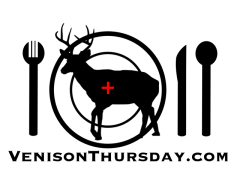 The heart on a whitetail deer isn’t that large, maybe a little bigger than your fist (varying per deer, and you of course). It does a LOT of work, and the muscle walls are fairly thin, so they are tough. You can cook the heart anyway you can cook any meat. With standard cooking methods though, you’ll pretty much get one meal: either a good sized meal for one person, or very small portions for multiple people. Cut off the cap of fat along the top, as well as any “plumbing” parts that may be left. 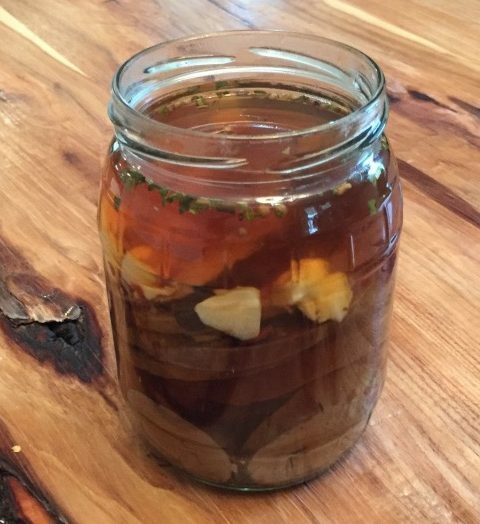 Because of the heart’s size, toughness, and quantity (I only get one to two hearts a year), I almost always go with one preparation method: pickling. Once pickled, the heart becomes more of a condiment rather than a main course. It’s awesome as a snack right out of the jar. Of course, my favorite use is on sandwiches. On a sandwich, you can go two ways: thick, as the main meat; or thin, as a fine layer of texture and flavor. 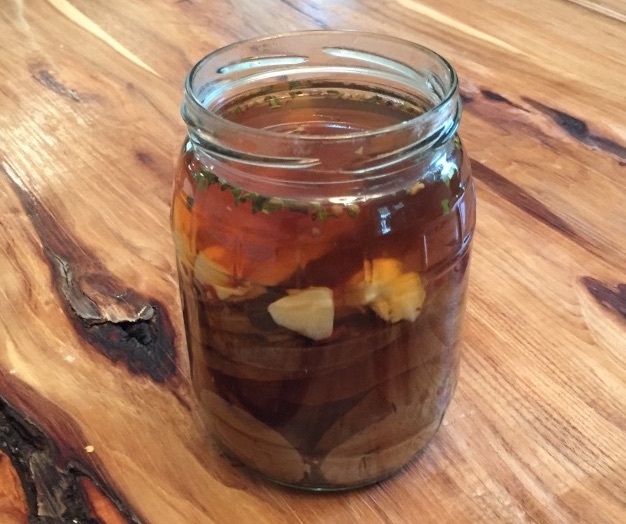 This recipe makes more pickling juice than you need for one heart. Maybe even four. You can store the extra in the fridge for when you get more deer later in the season, or if you have a big jar, you can keep adding heart to it when you get another deer. This recipe can easily be adjusted. The types of ingredients, amounts, and even the slice size of the heart – you’ll find there are just certain things you prefer. But trust me, if you only have plain vinegar, and regular sugar, it will still be just as good. Take the heart, and trim off the fat cap and any vessels that didn’t get trimmed during field dressing. Place it in a pot, and fill the pot with water till the heart is just covered. Simmer on the stovetop for 45 minutes, avoid a rolling boil. While the heart is cooking, place all the other ingredients in a pot and bring to a boil, stir, and remove from heat. This just gets all the salt and sugar to dissolve, as well as getting the other flavors to meld. Take the heart and rinse it under cold water. Or let it cool on a plate. This is more so you can handle it: slicing up a hot heart is not fun on your heart holding hand. DON’T POUR THE HEART WATER DOWN THE SINK. The water you boiled the heart in will have melted out any fat left on the heart after you cleaned it. When this fat solidifies in your pipes, your plumber will thank you for the extra work. Use it as gravy for your dog’s food. Or let it cool and pull the fat off before dumping down the drain. 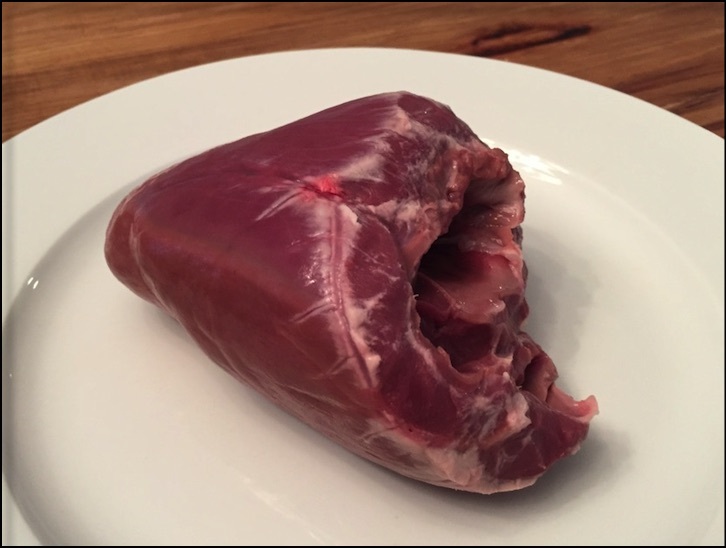 After boiling, slice the heart into quarter inch slices. Slice the heart in quarter inch slices. You can go thinner or thicker. As you are slicing, clean out any of the little arterial branches you see on the inner chambers. They don’t taste bad, but can be pretty chewy. 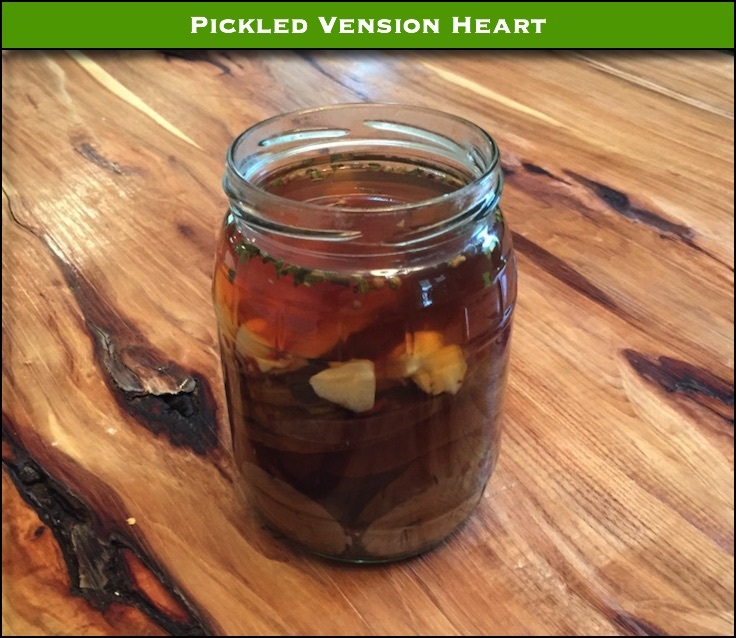 Put the sliced heart in an appropriately sized jar, and cover with the pickling fluid. If you have a lot of extra fluid that you don’t use, just make sure you get a decent amount of the garlic and spices into the jar. Let it sit in the fridge for a week. 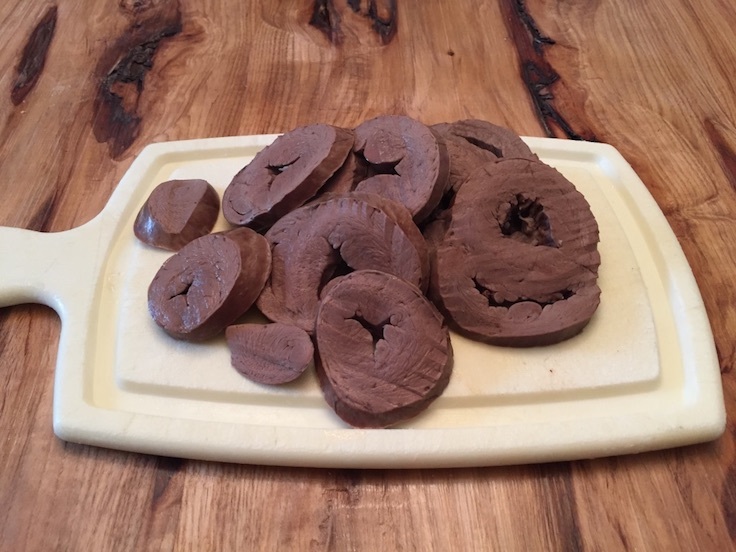 Previous Previous post: Venison Summer Sausage – Jalapeño and Cheddar, and Fat?